Jade Dernbach: "Title is the best thing that's ever happened, to be honest." 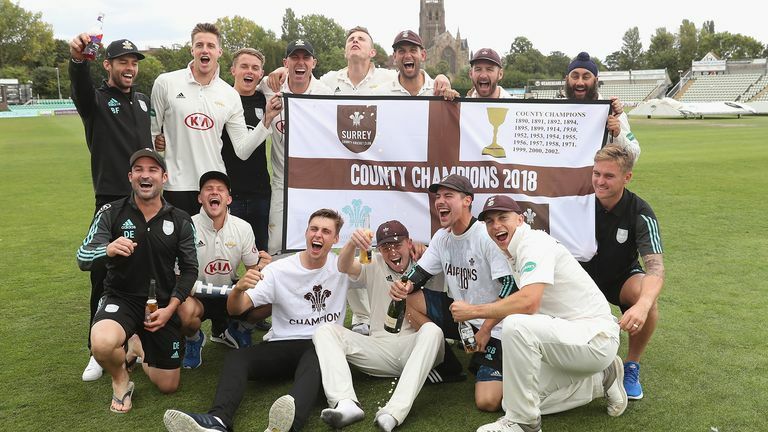 Jade Dernbach paid tribute to absent club captain Gareth Batty after Surrey won the Specsavers County Championship with a three-wicket win over Worcestershire at Blackfinch New Road. Batty was appointed Surrey captain in 2015 but has not played in a single championship match this summer following the emergence of off-spinner Amar Virdi. And instead of enjoying his side's first Division One title since 2002, Batty was turning out for the Second XI at Guildford. Fast bowler Dernbach, who made his debut for The Oval club the following season in 2003, said on Surrey's Twitter account: "It's the best thing that's ever happened to be honest. Watch Rory Burns' surprise champagne moment! "It's the proudest moment of my career for many reasons - the group of players that we've had that have done it, but equally the things that have come before us and the people that have put everything in motion for us to be in this position is something else. "I want to make a special mention to Gareth Batty, everything he did, things like that are what got us into the position to be able to do this." Veteran all-rounder Rikki Clarke, who was part of the triumphant 2002 side and contributed 443 runs and 43 wickets after returning from Warwickshire last year, also hailed the backroom staff. "Everything we've done has been a team effort," the 36-year-old said. "We work for each other, we fight for each other. "All the hard work that's been put into this squad - the backroom staff have been brilliant, the players have been brilliant, and we love each other's company. That's such a special environment to have." Alec Stewart reflected on five years of improvement after openers Rory Burns and Mark Stoneman laid the foundations for the tense victory over Worcestershire with a century stand, the day after Morne Morkel had taken five wickets. Stewart, who took over the role of director of cricket in 2013, admitted: "Things were struggling. I can't hide behind that. "But things don't happen overnight and that's where the chief executive (Richard Gould) and chairman (Richard Thompson) were very good. "I said, 'if I'm going to come back, let me try and do it my way and if it doesn't work kick me out - but if it does work then you can pat me on the back, even though it will be the players who have done it'. "I said, 'give us a couple of years to get things to where they potentially could be to then move forward' and that's what has happened. "You've got to have a Surrey nucleus to the squad. It's almost a unique club in that you've got to understand the club to work there I think." Stewart was also full of praise for the players, adding: "They have grown together. "It's a real shame Gareth Batty is not here because he has played a massive part over the last four years and is running the second team today. "It's nice to sit back now and watch this group grow together but the thing is they've got to continue to grow." Worcestershire head coach Kevin Sharp said: "It was a terrific game of cricket and it could have gone either way right to the end. "The lads have gone toe to toe with the county champions and I'm very proud of them."